I mean a REALLY long time, right? It’s not so much the actual writing process, it’s all the bells and whistles that surround it. Conducting keyword research, finding killer examples, taking screenshots, uploading it to your site, promoting it… Everything adds up to one giant task. Sometimes it feels like blogging could literally be a full-time job, and for most of us it’s not. If you’re familiar with my style of blogging, it’s usually pretty long and epic. But today I’m not going to put together a MASSIVE resource on one broad topic. Instead, I want to share one simple tactic I use to actually create all of that long stuff. It’s a research tactic that helps me write BETTER content, more QUICKLY and more OFTEN. I call it the ‘Content Booster Hack’. Let’s say you’re a small business coach and you want to help your potential customers put together a 6-month strategy document. The obvious place to start is to gather together anything else you have already written or created about strategy development. This makes sense because you’ve already done the bulk of the thinking. Next, you want to expand on your own thoughts by finding out what other people have written about this topic – so you take it to Google. Into a Google search you type “small business strategy”. After skimming through a few of the articles on this topic, you collate a list of 8-10 subheadings that are interesting and add them to your already gathered content, along with a small snippet of text. You rinse and repeat this process with some other similar terms such as “how to develop a small business strategy” and “small business plan” … a few times until you have a decent sized list of sub-topics to include in your post. Then, to finalize the research you re-structure this list so it creates a nice flow and narrative. At this stage you’re feeling chuffed… And rightly so. You’ve just done some decent research for your blog post and it’s pretty much written itself by now. Are you happy to rest there? You shouldn’t be… Because anyone can do what you just did. It took you about 30 minutes, maybe an hour. But your goal is to put together a resource that is better than anything else already out there, so you can stand out from the crowd and get noticed… right? If you really want to stand out and get noticed, you need to boost your content. Before you can BOOST your content with this hack, you need to have a blog post structure nailed down. In the small business coach example, by searching for a small cluster of related terms that contribute to strategy development, and finding your best thinking on the topic already, you’ve probably got a decent list of subheadings or sub-topics that will form the structure of your article. Instead of just searching for the main topic like you have above… You want to find individual articles, presentations, videos and infographics specifically about EACH of the sub-topics in your structure. For example let’s imagine that under the topic of “small business strategy“, a sub-heading is “defining your target customer“. Now you can discover all the best content already out there about this sub-topic – and go extremely deep (deeper than anyone has before) on that sub-topic AS WELL. You will begin to discover that each sub-topic has a ton of interesting information about it. As you collate the most interesting and engaging stuff on each of the sub-topics, your draft structure starts becoming MASSIVE. But that’s a good thing, because it is preparing you to write something better than anyone else. If you use the content booster hack for all of your sub-headings, and collate the best content out there… you’ll be on your way to putting together a resource that will be easier to promote, attract high quality backlinks and boost your search engine rankings over time. Of course, once you’ve collated all this research you need to re-write it with your own logic, create your own meaning, take a unique position on the topic and sprinkle it with other examples. But the bulk of the hard work lies in the research. By using the content booster hack you are going above and beyond what ANYONE else will, for that topic and all of the sub-topics – you will in return create an EPIC piece of content that blows anything else out of the water. Let’s see how the content booster hack could help you write a one-of-a-kind introduction for your blog or article. For every introduction you read in this research, grab the 1 or 2 points that make it POP. In the “small business strategy” example, one of the articles that came up in the Google search was from Small Biz Trends. You can see I’ve highlighted some of the key points in this introduction – such as the pain points, benefits and common challenges. They’ve already done some of the thinking for you, in terms of WHY a small business strategy is important. You don’t have to re-create the wheel. If you then save these “Points that POP” in your master document, under a sub-section called “Introduction” – when you actually write your own introduction, the juices will flow. When it comes to writing your introduction, not only will it be quicker and easier than if you had a blank canvas to work from… but it will be better too. 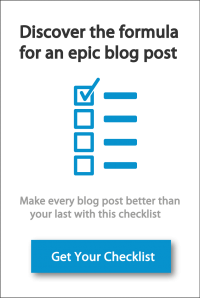 The post-type that this hack will help you create really quickly is the listicle… or the list post. Let’s take one of the first ever long posts I wrote here at Blogger Sidekick; 30 Factors to Launch and Run a Successful Business Blog. Do you think I just made all of those factors up? Of course not… I went through the exact process I’m describing in this post. At first, I gathered together everything I already had written about the topic. Then, I found the best resources already out there. One of the 30 factors in that blog post is to promote your content – strategically and deliberately. I could have just written this section based on my own experience… It may have been good. But instead, I used the content booster hack. To find the best content on that individual point in the list, I searched for “how to promote blog content” across all the platforms I’ve mentioned in this post – Google, SlideShare etc. It helped me discover dot points, examples, statistics, quotes and images that would bolster an already substantive resource. But more importantly, it helped me better understand how I would shape my unique opinion and position on the topic. How do you research your anchor content? What hacks, tips or tactics do you find work well? How to Find People Who Will Backlink To Your ContentWhat is a content anchor?